The Milwaukee Bucks announced March 30, 2017, a new partnership with Johnson Controls, a global multi-industrial leader, to become the official “smart building” partner for the new Wisconsin Entertainment & Sports Center in downtown Milwaukee. As the “smart building” partner of the new Wisconsin Entertainment & Sports Center, Johnson Controls will work closely with the Bucks, Mortenson Construction, ICON Venue Group and numerous industry-leading subcontractors to furnish, install and integrate state-of-the-art smart building solutions throughout the new facility. Johnson Controls Chairman and CEO Alex Molinaroli discusses the company's partnership with the Milwaukee Bucks during a press conference March 30, 2017, as Bucks President Peter Feigin watches. Johnson Controls is the official “smart building” partner for the new Wisconsin Entertainment & Sports Center in downtown Milwaukee. The Milwaukee Bucks announced March 30, 2017, a new partnership with Johnson Controls, a global multi-industrial leader, to become the official “smart building” partner for the new Wisconsin Entertainment & Sports Center in downtown Milwaukee. As the first Founding Partner for the new arena, Johnson Controls will implement a variety of building technology solutions throughout the facility to enhance the fan experience, improve the building’s performance, reduce energy usage and reduce the arena’s environmental foot print. Together, the Bucks and Johnson Controls are building a smart, sustainable and efficient world-class arena while joining together in a commitment to develop a healthier and more vibrant Milwaukee community for future generations. The new Milwaukee Entertainment & Sports Center is the centerpiece of an ambitious development project spearheaded by Bucks ownership to transform 27-acres of mostly vacant property into a vibrant retail and entertainment district in the heart of downtown Milwaukee. 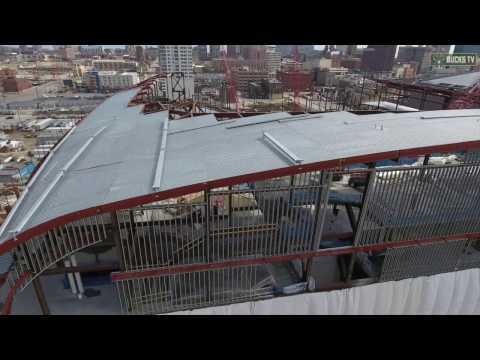 Scheduled to open in fall of 2018, the 714,000 square foot arena will be home to Milwaukee Bucks basketball and countless sports and entertainment events. The new arena was designed by Populous, Eppstein Uhen and HNTB, with Mortenson tabbed to lead the construction of the project. For more information, visit www.wisconsinesc.com. Johnson Controls and Hall of Fame Village to create first-ever sports and entertainment "smart city"
The future is being built today, and Johnson Controls is making that future more secure, more productive, and more sustainable.